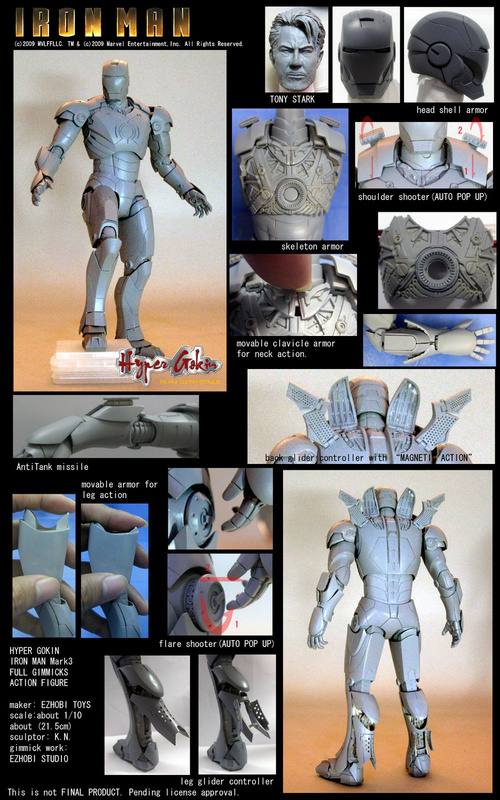 The Toyark › Marvel Toy News › Hyper Gokin Iron Man Prototype! Hyper Gokin Iron Man Prototype! It’s been a while, but we now get to see the prototype of the Hyper Gokin Iron Man figure! Featuring numerous gimmicks, from the Iron Man movie, this mkIII armor has magnetic back panels, auto pop-up flare shooter, arm mounted missle launchers and more! Basically, whatever panel or piece of armor that you saw move in the movie moves on this figure! Click on the thumbnail to the left to check it out! Discuss on the Toyark Forums› Views: 4091 › Credit: QuantomShock of the Toyark Forums! We now have an update to the Hyper Gokin Movie Iron Man figure shown here months ago. It's been a while since we've seen anything, but click here for the update! This is nice. Wondering what the finished product will look like all painted. The paint scheme and final materials will make or break this. The sculpt is nice and detailed, and all the moving parts are great. But if the final paint is too dull or the final parts are too soft or brittle, then it won't be worth investing in. 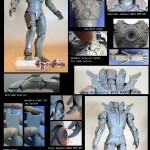 Keerist... considering how much the Hot Toys mark III kit cost, how much is THIS gonna cost?!?!? Most likely less, from what I remember, this one is only 8" tall. yea, well if they do price it close to the HT one theyll have no one buying because everyone will be going for the HT version since its bigger, more detailed, and only costs a little more. Except that the Hyper Gokin version will be made of metal. Not IRON, obviously, but it's still going to put itself into the gokin market which entices a different kind of collector who will happily ignore the larger, lit up Hot Toys version in favor of this one. oh yeah, the damn metal parts. Full Thread: Hyper Gokin Iron Man Update!